Margaret (Peggy, Granny) Koehler, 78, from Vernon, peacefully entered into eternal rest on April 24, after a prolonged illness. Peggy was born in Manchester, CT, to Benjamin and Catherine Balon. She grew up in the North End of Manchester, and moved to Vernon where she lived her entire adult life. 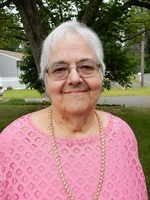 Peggy graduated with honors from Manchester High School, and from Manchester Community College in 1977, while holding a full-time job and raising four children. She was a parishioner of St. Bernard Church, Rockville. After retiring from Manchester Memorial Hospital with more than 30 years of service, Peggy spent countless hours volunteering for Visiting Nurses, Hospice, and Manchester Historical Society. She was a voracious reader and an avid quilter. She was a proud member of the Red Hat Society, but what was most precious in her life were her four grandchildren. To send flowers to the family of Margaret J. Koehler (Balon), please visit our Heartfelt Sympathies Store.